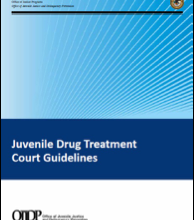 On December 20, 2016, the Office of Juvenile Justice and Delinquency Prevention (OJJDP) released “Juvenile Drug Treatment Court Guidelines.” Juvenile drug treatment courts (JDTCs) are designed for youth with substance use disorders who come in contact with the juvenile justice system. These courts offer a way to respond to the needs of substance-using youth and to treat their complex disorders, which require specialized interventions. The new JDTC guidelines offer courts, families, and youth an evidence-based, treatment-oriented approach that emphasizes family engagement and addresses the substance use and often co-occurring mental health disorders experienced by many adolescents engaged with the justice system. Currently operating JDTCs will find the guidelines useful for developing strategies for reforming current practices to bring them in line with evidence-based practices. New JDTCs will find the guidelines helpful in designing their JDTC model and practices. The guidelines, an interactive map that helps users navigate through each guideline, supporting research reports, and additional resources are available here. OJJDP partnered with a research team led by the American Institutes for Research (and including the WestEd Justice & Prevention Research Center, Vanderbilt University, George Mason University and the Court-Centered Change Network), experts in the field, and other Federal Agencies to develop the evidence-based, treatment-oriented guidelines to support judges and professional court staff, youth with substance use disorders, and their families. OJJDP is also planning to help courts implement and test these guidelines through training, technical assistance, and programmatic initiatives, including a series of free webinars.